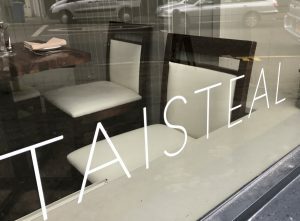 A kindly gluten eater treated me to lunch at Taisteal in Stockbridge this week. ‘Taisteal’ means travel in gaelic and this new place is definitely worth a bit of a journey. A stylish look, a great value £10 ‘Market Menu’ plus clarity and choice for gluten free, this is a restaurant to seek out when you want something a bit different. As with many restaurants of this calibre, the GF eating is not going to be a problem as much of the menu is gluten free anyway and the kitchen is small and clearly well run. The Market Menu changes to use local and seasonal food – something that should always be supported! There were three choices of each course and only tiny tweaks were required to make it pretty much all ok for me. No GF bread appeared, but as it was lunchtime, this was not really an issue. To start we had the cauliflower and curry soup of the day. 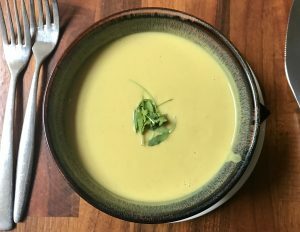 Beautifully creamy and a delicate yellowy colour, this soup should have packed a punch, but was somehow a little tame. This may have been because the gluten-loaded version included a little onion bhaji on top which mine by necessity, was missing. Main courses were more punchy and my hake with a pile of creamy potato pieces floating in a sea of tomato on a brilliantly blue plate, was certainly full of flavour. The soupy-ness of the sauce created a very good mix of textures and I particularly loved the colours going on here. The crockery is definitely worth a mention as each piece is creative and unusual – I really loved it. My gluten eating diner enjoyed slow roasted pork belly with jambalaya, which was a stack of colours and flavours. The third main course was aubergine, and the mix of foods and colours really makes Taisteal more than a restaurant – it is actually a topic! We skipped pudding, though a rhubarb mousse sounded very tempting and I am sure would have come in a mix of vibrant colours. Adding just some coffee, this meal was superb value and a great way to try one of the new restaurants in town. The experience is understated but the service is good and the value of a lunch like this with plenty of GF is mad to miss.